Use our free Bible Journal Selection Tool to find the perfect Bible Journal for you! 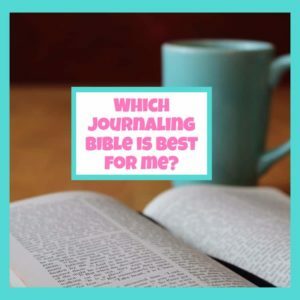 Which Bible Journal is Best for Me? Our Journaling Bible selection tool helps you find the perfect Bible based on your preferences. There’s no email required to use it. Please share it with a friend! Click here to find the best deal on Single Column Bibles for Journaling. Click here for the best prices on coloring Bibles. Click here to shop for Bibles. The Bible Journal selection tool is designed to help you find the right Bible to journal in based on your preferences. There’s no opt-in and no email required! Just complete the five simple questions in this survey to receive your Bible Journal recommendations. There’s no purchase required either. However, if you decide to purchase a Bible based on your results, we may receive a small fee. Thank you. Your purchase helps keep our ministry going.